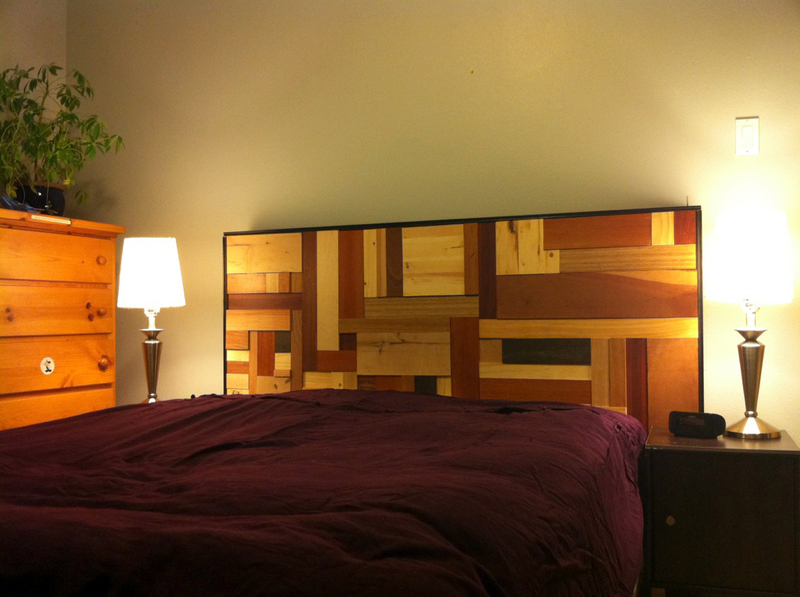 Jenn Anderson was in need of a headboard for her bed, and wanted to find an inexpensive and creative way to build something for herself. She saw a chair made of scrap wood in a shop in Ballard that was her initial inspiration. Only having a chop saw to use for this project informed her design idea as well, knowing that she could only make short cuts. She found the plywood backing on the side of the road in for free, and bought 2 2×4’s new to make the frame. She then headed to The RE Store for the small pieces of various woods including pine, bamboo, and mahogany bits – making it about 80-85% reclaimed material! This was her first big carpentry project to tackle, and she felt like she learned a lot in the process – only having one snafu when she was mounting the boarder pieces (which she thinks were probably too hard for the type of screw she was using). Other than needing to figure out how to brace it to the wall, she is very happy to have the new furniture piece in her home – something low cost that she created!